This article is the fourth and last in a series that deals with coral reef aquarium chemistry issues on a basic and practical level. Its primary purpose is to get new aquarists to focus on those aspects of reef aquarium chemistry that are truly important instead of those that are not. New aquarists are bombarded with a huge assortment of issues and opinions related to aquarium husbandry practices, and none seems to cause more anxiety than chemistry issues. Some of these issues are actually very complicated, and the answers to many questions are simply not known. Fortunately for hobbyists, knowing the answers to these questions is rarely important to keeping a wonderful reef aquarium. Those issues that are important to understand are much more straightforward and can be solved without excessive anxiety. The first article in this series focused on issues related to the saltwater used in a coral reef aquarium, including selecting salt mixes, measuring salinity and purifying tap water. The second article focused on which additives are necessary and useful, and which may not be. The third article focused on issues related to aquarium pH. This fourth article in the series deals with concerns about compounds that may build up in the aquarium and potentially cause problems. These chemicals include nitrate, phosphate and organics. Why worry about such chemicals? Some encourage the growth of undesirable microalgae, others inhibit calcification and growth by corals, and still others can be toxic to many organisms. Consequently, it can be desirable to keep track of such impurities, although it may not be possible under ordinary circumstances to routinely measure some of these impurities. Many methods can prevent the excessive buildup of undesirable ions in marine aquaria. Some are easy to use and inexpensive, while others may be more expensive and complicated. Commonly used methods include skimming, growing macroalgae or other organisms for export, and using media that bind certain impurities. In many reef aquaria, a combination of different methods works best. I use several in my coral reef aquarium system, including all three of those listed above, as well as others (such as ozone). This article focuses on why aquarists should be concerned with certain impurities and what target ranges I recommend, and discusses some of the most effective ways to maintain adequately low levels of each specific impurity. Many chemicals can build up in closed coral reef aquaria. Some of these may be part offoods, top-off water or chemical supplements. Others are generated in the aquarium itself. Knowing how such chemicals get into aquarium water, and what to do about each, are the primary focuses of this article. Subsequent sections will deal individually with each of the chemicals of concern. Many of the chemicals that can potentially accumulate to undesirable levels are well known to most aquarists. These include ammonia, nitrate and phosphate. Others may be less well known, such as certain metals or organics, but that does not necessarily mean they are unimportant. In many cases, data on their toxicity are clear. Ammonia, for example, is clearly very toxic while nitrate and nitrite are not generally very toxic in marine aquaria, although they may be undesirable for other reasons, such as their role in encouraging algal growth. For these types of ions we can set reasonable limits and goals for aquarium concentrations and, luckily for us, they can often be quantified with available test kits or probes. In some cases, however, the toxicity of the chemicals that accumulate in aquaria is less well known. The toxicity of most accumulating organics, for example, and even some metals when complexed to organics, fall into this poorly understood category. In some ways, that is just as well because testing for these sorts of complex chemicals is also nearly impossible for hobbyists. My suggestion with regard to these complex situations is to attempt export with a general method (such as skimming or activated carbon) so they do not accumulate indefinitely, and then to rely on the experience of the many highly successful reef aquarists to show that such measures are usually adequate. I will not generally address dealing with overdoses of supplements, or problems caused by using inappropriate supplements, because there are too many possibilities to include in an article of this scope. Nevertheless, aquarists should realize that supplement overdosing may introduce potentially detrimental levels of certain chemicals. Water changes, as detailed in the next section, are a generally useful technique for dealing with overdoses of normal supplements. Before discussing specific accumulating chemicals with specific solutions, it is worthwhile to understand what water changes can and cannot accomplish. In general, water changes are a good way to limit the accumulation of impurities that are not otherwise easily removed. For example, certain organic ions are too hydrophilic (water loving) to be removed by skimmers or bound to activated carbon. Another example is if magnesium levels become too high due to overdosing. In these cases, a water change is a good way to correct, or at least alleviate, the problem. In general, I strongly believe that water changes are a good way to keep all the ions in a reef aquarium close to normal (assuming that the saltwater used is “better” than the existing aquarium water). For general purposes, I recommend changing 20-30% per month. In my own case, I accomplish that by changing 1% per day automatically with a dual head pump. Figure 1 (below) shows what might happen to the concentration of a typical impurity ion (shown here as nitrate) over the course of a year as a consequence of a variety of different monthly water change schedules. Note, however, that the analysis in Figure 1 assumes that no new nitrate accumulates. That is, of course, not the norm in reef aquaria without other export methods. Actually, nitrate and other impurities often continually accumulate. In such a situation, the concentration over time might look more like Figure 2 than Figure 1. In that case, even after a year of 30% per month water changes, nitrate never reaches the target level (less than 1 ppm; to be discussed later in this article). In general, this applies to all accumulating ions for which a low target level is chosen: water changes help, but will not usually allow the goal to be attained if they are the only method used. As mentioned above, however, there may be no other good method to remove some impurities, and water changes play an important role for their reduction (as well as for supplementing ions that may be slowly depleted). Figure 1. Nitrate concentration as a function of time when performing water changes of 0% (no changes), 7.5%, 15% and 30% of the aquarium’s total water volume each month. In this example, nitrate is present at 100 ppm at the start, and is not added or depleted during the course of the year except via the water changes. The y-axis can alternatively be thought of as the percent of the original concentration remaining of any material that is not being added to or depleted from the water, except via the water change. Figure 2. Nitrate concentration as a function of time when performing water changes of 0% (no changes), 7.5%, 15% and 30% of the aquarium’s total water volume each month. In this example, nitrate is present at 100 ppm at the start and accumulates at a rate of 0.1 ppm per day when no water is changed. Ammonia is one of the most studied chemicals in aquaria, and the details of its uptake, excretion and mechanisms of toxicity continue to occupy many research scientists. Because of its high toxicity, it is critically important in both freshwater and marine systems. In fact, it is one of the few important chemical issues that marine and freshwater aquaria share. Most reef aquarium animals excrete ammonia (NH3). If there is no adequate way to remove this ammonia, either by converting it into something less toxic such as nitrite or nitrate, or removing it by incorporating it into growing organisms such as macroalgae, it can rapidly build up to undesirable and toxic levels. Established reef aquaria do not ordinarily require routine ammonia measurement because such systems typically have adequate bacteria or other organisms that rapidly convert ammonia into less toxic compounds. I never measure it in my main reef system. However, measuring ammonia can be very important when fish are housed in temporary quarters, such as shipping bags, hospital tanks and quarantine tanks. Most aquarists associate ammonia with new aquarium "cycling," and in that situation it is critically important to wait for the ammonia level to decrease to very low levels before adding organisms (this is much more important than waiting for nitrite to decrease, for example). Ammonia can also be very important during aquarium crashes, such as during a prolonged power failure. In all of these situations, I recommend striving to keep ammonia below 0.1 ppm total NH4-N (which reads as “total ammonia nitrogen”). If the level rises above 0.25 ppm total NH4-N, I suggest taking immediate remedial action, such as using an ammonia binder (e.g., Amquel or Seachem Prime) or performing substantial water changes. Ammonia is readily measured with inexpensive test kits, but they can be a little confusing because they often refer to different forms (ammonium ion and “free” ammonia,” together giving total ammonia). While there are important differences between these forms, as indicated below, I would always recommend measuring total ammonia. In part, that is because it is always higher than either individual form, and so can be easier to detect above the background uncertainty of the kit being used. The linked article below explains in detail these and other complications involving the units of measuring ammonia. In aquaria with high pH levels, which contain less H+, more of the total ammonia is in the NH3 form. Consequently, the toxicity of a solution with a fixed total ammonia concentration rises as pH rises. This is important in such areas as fish transport, where ammonia can build to toxic levels. Most aquarists have some familiarity with nitrite. It is part of the "nitrogen cycle" that takes place in most aquaria, and so is one of the first encounters that many aquarists have with their aquarium's chemistry. The marine aquarium hobby is replete with commentary about nitrite, some of which is, unfortunately, incorrect or misleading. Its toxicity in marine systems seems to be far lower than in freshwater systems. This difference is striking, with some of the most sensitive freshwater species being more than a thousand times more sensitive than typical marine species. Does this apply to all fish that might be kept in reef aquaria? I have no way of knowing. I have seen nitrite toxicity test results on only one marine species that we normally maintain in reef aquaria. Nevertheless, there is no reason to think that the species that we keep are more or less susceptible than the other marine species that have been tested. Few tests of nitrite's toxicity to marine invertebrates have been reported. Those that have suggest that lethal doses of nitrite are fairly high (i.e., tens to thousands of ppm nitrite). Fortunately, nitrite levels in reef aquaria are almost always far lower than would cause concern from a toxicity perspective. While a new aquarium's nitrite levels might reach up toward 10 ppm or more, such an aquarium should not yet contain sensitive organisms. Once the nitrite level is below 1 ppm, there is little reason to be concerned with it, and rarely does nitrite become substantially elevated later. From my perspective, nitrite and the nitrogen cycle may be interesting phenomena to monitor during a reef aquarium's initial setup, but nitrite does not warrant routine testing. I haven't tested any aquaria for nitrite in years, despite setting up several in that time. I simply do not think that nitrite is worth the time and expense of testing. My opinion is that many things other than nitrite concentration are more worthy of reef aquarists' attention. If, in fact, nitrite is elevated beyond the levels the aquarist desires, performing water changes or removing the sensitive organisms until the nitrite level drops may be the best immediate course of action. Some chemical treatments claim to reduce nitrite, but it is not apparent to me that the byproducts are actually less toxic then nitrite in marine systems, so they may not be an optimal solution. Nitrate is an ion that has long dogged aquarists. The nitrogen that forms it is added with foods and can, in many aquaria, raise the nitrate level enough to make it difficult to maintain natural levels. A decade or two ago many aquarists performed water changes with nitrate reduction as one of their primary goals. In most cases, however, water changes alone cannot keep nitrate at natural seawater levels (Figure 2). Fortunately, we now have a large array of tools to keep nitrate in check, and modern aquaria suffer far less from highly elevated nitrate (greater than about 20 ppm) than those in the past. Nitrate is often associated with algae, and indeed the growth of algae is often spurred by excess nutrients, including nitrate. Other potential aquarium pests, such as dinoflagellates, may also be spurred by excess nitrate and other nutrients. Nitrate itself is not particularly toxic at the levels usually found in aquaria, at least as is so far known in the scientific literature. Nevertheless, elevated nitrate levels can excessively spur the growth of zooxanthellae (the photosynthetic symbiotic algae living in corals and anemones), which, in turn, can make the coral appear brown and actually decrease the host coral's growth rate. For these reasons, most reef aquarists strive to keep nitrate levels down. A good target is less than 0.2 ppm nitrate. Reef aquaria can function acceptably at much higher nitrate levels (say, 10-20 ppm), but run greater risks of the problems described above. Measuring nitrate is more complicated than many aquarists assume. Test kits are surprisingly inaccurate. No sophisticated scientific testing is needed to verify that fact. Many aquarists have found that using several different brands of nitrate test kits leads to several very different reported nitrate concentrations in the same aquarium. These levels can range from no nitrate detected (often less than 0.5 ppm) to 50 ppm or more in the same tank. American Marine (Pinpoint) has recently come out with an electronic nitrate detection probe based on a nitrate selective electrode. I have used it and find it fairly easy to use (although it does not detect nitrate continuously the way a pH meter detects pH), but I have not verified its accuracy. Nevertheless, in principle it seems sound (it is an established method in other industries) and may become an important tool for reef aquarists in the future. At the moment I do not have a good answer to how to proceed with nitrate testing, aside from noting that many successful reef aquaria do have some nitrate, so aquarists should not obsess on nitrate levels, in my opinion. There are many ways to reduce nitrate, including reducing the aquarium's nitrogen inputs, increasing nitrogen export by skimming, increasing nitrogen export by growing and harvesting macroalgae or turf algae (or any other organism of your choice), using a deep sand bed, removing existing filters designed to facilitate the nitrogen cycle, using a carbon denitrator, using a sulfur denitrator, using AZ-NO3, using nitrate absorbing solids, and using polymers and carbon that bind organics. Some aquarists add organic compounds (e.g., alcohol as in vodka, sugar, etc.) to drive bacterial growth as another option for reducing nitrate and phosphate. This may be the process by which AZ-NO3 works, as well. This bacterial growth process generally works well. It is also very inexpensive and may benefit the aquarium in other ways, such as providing a food source for certain organisms. Its drawbacks are that it is possible to drive the nutrient levels too low, and that it consumes oxygen as the bacteria use the added organics as a carbon source. The phosphorus atom is one of living matter's basic building blocks. It is present in every living creature and in every reef aquarium's water. It comes in with all foods because it is an integral part of all living matter. It can also come in with top-off water used in aquaria. For these reasons, it is often present in excess in reef aquaria, and that excess has the potential to cause at least two substantial problems for reefkeepers. The first is that phosphate is often a limiting nutrient for algae growth, so when elevated, it can permit excessive growth of undesirable algae. The second is that it may directly inhibit calcification by corals and coralline algae. Because most reefkeepers don't want either of these things to happen, they strive to keep phosphorus levels under control. Fortunately, there are several effective ways to keep phosphorus concentrations at acceptable levels. Phosphorus exists in two primary forms in seawater: as inorganic phosphate, especially orthophosphate, and as organophosphate forms. Orthophosphate is readily taken up by algae and actively inhibits calcification. The organic forms may or may not be available to organisms such as algae. Aquarists can readily test for inorganic orthophosphate using a standard aquarium phosphate test kit, but testing for organic phosphorus compounds is considerably more tedious. Moreover, if there is an algae problem, then the algae may be consuming the orthophosphate as fast as it enters the water, thereby masking the issue to detection with a phosphate test kit. Consequently, many reef aquarists may not recognize that they have a phosphate problem, only that they have an algae problem. Problems involving phosphate and subsequent algal growth can be among the most difficult to solve in a reef aquarium, especially if the live rock and sand have been exposed to very high phosphate levels, after which they may act as a phosphate reservoir for future release. Fortunately, steps can be taken, even in the absence of any algae problem, that benefit reef aquaria in a variety of ways, not the least of which is reduction of phosphate levels. These include skimming and growing macroalgae. All reefkeepers, and especially those designing new systems, should have a clear idea in mind about how they expect to export phosphorus from their system. If allowed to find its own way out, it more than likely will result in the undesirable microalgae that many reefkeepers constantly battle. In a reef aquarium where phosphate is known to be elevated, or where the potential for it to become elevated is significant, such as with heavy feeding, additional actions can be taken beyond those described above. Most of these methods involve binding phosphate directly, and this can be accomplished with a solid particulate binder, of which many different types and brands are available. These particles may be aluminum oxide (white), iron oxide (usually red/orange, brown or black), or any of several other materials. Note that all of these have the potential to dissolve to some extent, and release some of their basic components into the water, despite their manufacturers' claims to the contrary. I generally prefer the iron-based materials to the aluminum-based materials, because aluminum seems to sometimes irritate corals when it dissolves, while the iron-based materials do not seem to cause such a problem. I have seen no information that usefully distinguishes between different brands of GFO (granular ferric oxide, the iron-based binders), although one has recently been introduced to the trade with large particles that are more amenable than smaller particles to use in typical media bags (Warner Marine PHOSaR). I recommend rinsing all of these media prior to use to get rid of unusually small particles that may wash into the aquarium (also known as fines) that will readily wash into the aquarium. I have used many brands of GFO in a media holder in a Magnum canister filter, and some aquarists prefer to use them in reactors, which keep them moving to reduce clumping (but which also may physically break the particulates, releasing fines into the aquarium over time). One potential concern about the combination of regular use of GFO (or other phosphate binders) and growing macroalgae is that the GFO may actually bind phosphate so effectively that the macroalgae are unable to grow, andmay die. Consequently, the macroalgae's nitrate reducing capability is lost. If that happens, reducing the amount of GFO used, or using it intermittently may be useful. Some commercial phosphate binders are actually soluble metals, such as lanthanum or iron. These are generally effective, but are not my preference because they may not permanently remove the phosphate from the system. They may simply store it in a place and form (iron or lanthanum phosphate particles) that may settle out as “sand” bits, which might eventually be released again (such as if the particles pass through the digestive tract of an organism that can redissolve the phosphate). Some aquarists add organic compounds (e.g., alcohol as in vodka, sugar, etc.) to drive bacterial growth as another option for reducing nitrate and phosphate. This process generally works well. It is also very inexpensive and may benefit the aquarium in other ways, such as providing a food source for certain organisms. Its drawbacks are that it is possible to drive the nutrient levels too low, and that it consumes oxygen as the bacteria use the added organics as a carbon source. Organics can cause a variety of different problems. Some absorb blue light, so they tend to yellow the water. Other organic compounds may be directly toxic to organisms, especially because many organisms produce highly toxic organics specifically to kill neighbors or prey, or to prevent themselves from being eaten by predators. Still others use nitrogen or phosphorus (or both) as part of their own structures, so they may contribute to problematic nitrate or phosphate levels if they are allowed to be metabolized by bacteria. Certain problem organisms in aquaria can also thrive on the organics present in the water, including cyanobacteria. Finally, organic compounds may even be able to inhibit calcification in corals. For all of these reasons, and additional possibilities not mentioned, it is desirable to limit the accumulation of organics in reef aquaria. There are a variety of ways to export organics. Because such a wide variety of different organics may accumulate, the best ways to export organics are somewhat generalized. Few aquarists measure organics in any useful way; they simply make an effort to reduce organics that fits their budget and their system’s needs. Can organics be reduced too far? Likely yes, especially for organisms that feed on organics (either soluble organics or particulates suspended in the water), but some organisms may thrive especially well in water with organics as low as is typically attainable in reef aquaria. The most general methods for reducing organics include skimming and using granular activated carbon (GAC). Both of these tend to bind completely or partially hydrophobic organics, but may not effectively remove very hydrophilic organics. In fact, water changes may be the only way to remove some of these accumulating hydrophilic organics, and that is one reason that I use all three of these methods. Activated carbon can be used passively, (in a media bag hanging in the water) or actively (in a canister filter or other device that forces water through it). I’ve used activated carbon both ways. In addition to binding phosphate, many commercial phosphate binders are also expected to bind certain organics. The binding capacity of these materials is substantially lower than that provided by activated carbon, but they may be able to bind a slightly different subset of total organic materials present in the aquarium (binding those that may be negatively charged, as phosphate is, but not necessarily hydrophobic (as skimming and GAC do). Finally, sulfur and carbon denitrators may reduce certain metabolizable organics, although no data have been generated to show the significance of such methods to organics in reef aquaria. Certain light absorbing organics are treated especially well with ozone. While ozone in reef aquaria does not directly cause the complete destruction of most organics, it does frequently remove certain organics' light absorbing capacity completely. Ozone can also change the chemical structure of many organic molecules, making them more easily consumed by bacteria. I use ozone on my aquarium, primarily for the reduction in yellowing that it achieves. A variety of metals, such as copper, can be a concern in reef aquaria. Regardless of these metals' concentrations in the saltwater used to set up or perform water changes (which may or may not be a substantial concern, as detailed in an earlier article in this series), these same metals can accumulate in an aquarium. I have demonstrated by measurement that copper, for example, has accumulated in my system. Potential sources of these metals are foods, top-off water, inorganic binding media (such as those intended to bind phosphate) and supplements (regardless of whether metals are intentionally added to the supplement or are present simply as impurities). I addressed various sources of potentially toxic metals in a previous article. None of these metals is easily monitored by hobbyists. Consequently, my recommendation is similar to that for accumulating organics: employ some method of export, and then do not worry excessively. This method works for most aquarists, and there is no reason it cannot work for you. In fact, metals and organics are rather intimately related, and methods of exporting organics generally export metals as well. This is because many of the most important metals (such as copper) are strongly bound to organic materials, and simply are seldom present as free inorganic ions (Figure 3 below). So when organics are removed by skimming or activated carbon, a substantial amount of metals is removed along with them. This is the expected result, and one that has been demonstrated experimentally (at least for skimming). Figure 3. 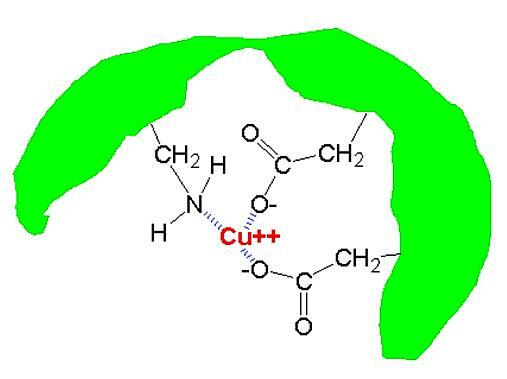 A schematic of a copper ion (Cu++, shown in red) being chelated by a naturally occurring organic material (a humic acid, shown in green). Water changes can often export metals. Of course, this happens only if the aquarium water's concentration of the particular metals of concern is higher than the new saltwater's. In my case, that is true of copper, because the Instant Ocean salt mix that I use has (or at least it had when I tested it) a lower concentration of copper (<10 ppb) than my aquarium (10-13 ppb). This result is yet another one of the reasons that I recommend routine water changes. Metals can also be exported in other ways. Growing macroalgae and other organisms also take up significant amounts of metals, effectively exporting them from the system if they are periodically pruned back and removed. Finally, and this may be especially useful in emergency situations, binding media such as Poly-Filters can bind certain metals (although I do not generally recommend them for routine use because some of them could also add certain metals unless their manufacturing recipes have changed recently). Hydrogen sulfide (H2S) is a toxic molecule that has the potential to be produced and accumulate in anaerobic regions in coral reef aquaria. Most often, these regions are encountered in sand beds or under live rock, especially when organic debris is buried. The presence of hydrogen sulfide is most readily noticed because of black metal sulfide deposits, or by the rotten egg smell that may be present when such sediments are disturbed. While there may be some hydrogen sulfide in some parts of my aquarium system, I have never had enough to worry about, and that is the case more often than not for other aquarists as well. If you do not see such black areas or smells, then don’t worry about it. Hydrogen sulfide is produced by the breakdown of organic debris under anaerobic conditions. At sufficiently high concentration it is not only foul-smelling, but can be lethal to many marine organisms. Some aquarists have experienced tank wipeouts when a powerhead fell onto a sand bed, disturbing it and likely releasing buried hydrogen sulfide. Being aware of when and how hydrogen sulfide can form may help aquarists to avoid elevated concentrations in their aquaria, and allow them to understand how to deal with it if such events occur. Aquarists sometimes have to deal with situations where hydrogen sulfide exposure is a possibility. The suggestions below may be useful for preventing or correcting such problems. 1. Avoid burying organic materials under sand or rocks. This organic material decays, and that decay can drive the formation of hydrogen sulfide. Burying live rock under sand, for example, likely will kill many organisms and when they decay, H2S may form. 2. When using a denitrator, be careful not to set its flow so slowly that it eliminates nitrate and sulfate reduction takes over. The ORP in the denitrator may or may not be a useful guide here, depending on the setup. 3. Do not store live sand for extended periods without placing it into circulating, aerated water. 5. Be careful that equipment failures (such as a powerhead falling off the side of an aquarium onto the sand) will not disturb sand beds, if sulfide deposits are suspected. 7. Do not store tank water or natural seawater without stirring and aeration for more than a few hours. Raw artificial seawater made with pure freshwater does not raise this concern, because it contains no organics to decay. It can be stored unstirred for as long as desired. B. Perform the change when the lights are as bright as possible, preferably near the end of the light cycle. The lights drive the O2 concentration higher, speeding the oxidative removal of hydrogen sulfide, and the light itself catalyzes the oxidation of H2S. C. Maximize aeration. A high oxygen level drives hydrogen sulfide oxidation, and high aeration drives some H2S off as volatile H2S gas. D. Add an iron supplement to help catalyze the oxidation of hydrogen sulfide and the precipitation of ferrous and/or ferric sulfide. Use one that's chelated to an organic; either ferrous or ferric iron works fine. F. Pass the water over activated carbon, which may bind some sulfide and may also catalyze the oxidation. If forced to choose between carbon and GFO, I'd pick the GFO media. 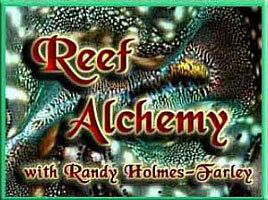 Many chemicals have the potential to build up to undesirable levels in coral reef aquaria. Water changes are a good way to help control certain processes that serve to drive reef aquarium water away from its starting purity, but are often inadequate to deal with the chemicals that have the greatest potential for accumulation and harm. The chemicals for which water changes are generally inadequate, except in unusual circumstances, include ammonia, phosphate and organics. These chemicals are best dealt with in specific ways, and aquarists should plan on ways to address them when planning or operating any coral reef aquarium. Some chemicals may accumulate only in certain situations, such as when certain supplements are used or overused. These include certain metals, sodium, chloride and sulfate. Water changes can help correct these imbalances and, in some cases, may be the best way to deal with them. Water changes of 15-30% per month (whether carried out once per month, daily or continuously) can be useful for moderating these different seawater components' drift from their starting levels. For most reef aquaria, I recommend such water changes as good aquarium husbandry. In general, the more the better, if carried out appropriately, and if the new saltwater is of appropriate quality.